No one wants bad breath. It can cause social problems and reduce your self-confidence. Aside from the social issues, having bad breath consistently also indicates that there may be something medically wrong with your body. Brush and Floss Twice a Day – Some people only brush and floss after they have had breakfast. But it is absolutely necessary to brush and floss before bed as well. It is important because germs and bacteria from the food often get stuck around the gums and between the teeth. These bacteria and germs not only contribute to gum disease, but they are also major contributors to bad breath. Flossing also helps to remove the food and bacteria that brushing alone cannot reach. Make it a habit to brush and floss twice daily. However, do not brush too hard, as you may end up damaging the enamel of your teeth. Weakened enamel leaves your teeth prone to decay. Rinse Your Mouth – Make it a habit to rinse your mouth with plain water after every time you eat. Doing so can help to get rid of the food particles that get stuck in your gums and between your teeth. If you are able to use mouthwash, then that is even better. Make sure that you choose a mouthwash that kills bacteria. If it has a minty aftertaste, your breath will be left smelling extra fresh. Clean Your Tongue – Don’t neglect your tongue while brushing their teeth. Scraping the tongue is very important if you want to avoid bad breath. Every time you eat, a biofilm layer accumulates. The bacteria that exist in the biofilm are a source of bad breath. Whenever you brush your teeth, make sure that you brush your tongue as well. To make sure that you are thoroughly cleaning your tongue, use a tongue scraper. They are available widely and are very convenient for removing the layer of biofilm. Stay Away From Tobacco and Foods That Give You Sour or Bad Breath – There are some foods which contribute to bad breath, such as onions and garlic. Brushing just after eating these foods won’t help either. Substances which cause bad breath are known to travel to the lungs where they are exhaled. To avoid bad breath, you may either choose to avoid such foods or avoid eating them before you go out. If you are a smoker, then this habit is likely exacerbating any issues that you may be having with bad breath. Tobacco does not only stain your teeth and damage your gums, it also contributes to bad breath. Take Care of Your Gums – One often does not notice the food particles stuck between their teeth. If you do not brush your teeth and gums adequately, bacteria may start accumulating around that food particle. Bacteria and plaque may not only cause cavities but gum disease as well. Gum diseases also contribute to bad breath. Bad breath, while unpleasant, can also be an indication of more serious dental issues. 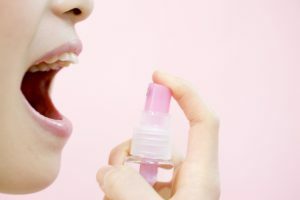 If you have chronic bad breath or if you do not notice a change after improving your oral hygiene, then it may be an indication that something is wrong. Getting regular check ups at Alla Agamov, DMD will aid in ensuring your dental health.